Name: JOHN FANE 11TH EARL OF WESTMORLAND (1784-1859) THREE FOLIO LETTER BOOKS OF HIS CORRESPONDENCE WHILST BRITISH AMBASSADOR IN BERLIN AND VIENNA 1841-43, 1850-51 and 1854-55 (Crimean War, etc). JOHN FANE 11TH EARL OF WESTMORLAND THREE FOLIO LETTER BOOKS OF HIS OFFICIAL DIPLOMATIC CORRESPONDENCE WHILST BRITISH AMBASSADOR IN BERLIN AND VIENNA 1841-43, 1850-61 and 1854-55 (Crimean War, etc). <?xml:namespace prefix = "o" ns = "urn:schemas-microsoft-com:office:office" />British soldier, diplomat and musician. 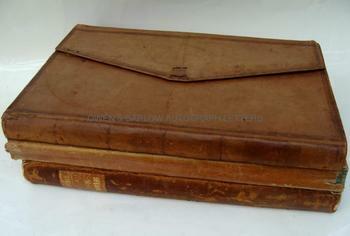 The letter books are partly autograph and partly in secretarial hands and each volume has a full index to its content. They contain the official retained copies of letters and dispatches written by Westmorland to the Foreign Secretary and his officials in the Foreign Office and other correspondents elsewhere. These deal with diplomatic intelligence, the reports of agents, the content of conversations with various royal persons, diplomats and foreign ministers, treaty negotiations, confidential communications, Embassy accounts and the payment of Foreign Office spies and other diplomatic materials. It is impossible in this necessarily concise description to adequately convey the scope and detail of these letters but the books contain in excess of 1,150 pages of official letters, dispatches and telegraphic communications from a rich and important period of 19th century European history. The events include the Zollverein and first stages in the unification of Germany, the Schleswig-Holstein question and Westmorland’s part as mediator and British signatory to the Treaty of Berlin, the Crimean War and Westmorland’s part in the negotiations which were to culminate in the Vienna Conference of March 1855 (where Westmorland, with Lord John Russell, was Britain’s representative in the negotiations that failed to reach agreement on the terms of a treaty to end the Crimean War). These are of considerable national and international significance and such materials are only rarely offered for sale. VOLUME 1 Berlin. 3rd December 1841 to 26th April 1843. As British Plenipotentiary to Prussia. Commencing with Westmorland’s arrival in Berlin to take up his appointment. 338pp plus a 10pp index to the 156 letters (many with lengthy transcripts of enclosures) which the volume contains. 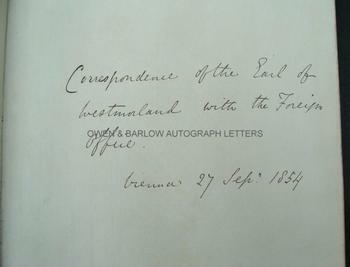 The letters are mostly addressed to Lord Aberdeen (then British Foreign Secretary and later Prime Minister) but there are also several addressed to Count von Maltzan (Prussian Foreign Minister who was removed due to severe mental illness in 1842), Baron von Bulow (von Matltzan’s replacement as Prussian Foreign Minister) and Lord Canning (then Parliamentary Under-Secretary of State for Foreign Affairs). The volume contains extensive and detailed communications on a variety of subjects. Of principal interest are Westmorland’s letters dealing with the Zollverein, the imposition of duty and various trade disputes which were, at that time, breaking out all over Europe, the moves towards commercial and political unification of the German States, the crisis posed by the proposed union of France and Belgium and the threat of war. The volume also deals with the suppression of the African slave trade and the views of other countries and diplomats on this, the censorship of the Prussian press and the closure of the Leipziger Allgemeine Zeitung, the assassination attempt on Queen Victoria, the Turkish and Polish questions and many other topics. Westmorland records and reports on conversations and private communications involving various figures, including Prince Metternich, von Bulow, the French Minister Mr Guizat, Count Bresson, Count Nesselrode, Count von Maltzan, the Prussian King and Queen and envoys of King Louis Philippe and the Emperor of Russia, amongst many others. VOLUME 2 Berlin. 24th May 1850 to 26th June 1851. As British Plenipotentiary to Prussia. 460pp plus an 18pp index to the 319 letters which the volume contains. The letters are mostly addressed to Lord Palmerston (then British Foreign Secretary and later Prime Minister). The volume contains extensive and detailed communications on a variety of subjects, commencing with the assassination attempt against the King of Prussia. Of principal interest, however, are the letters dealing with the Schleswig-Holstein question and Prussia’s war with Denmark. Westmorland was the mediator between the two sides in the crisis, many meetings and discussions taking place at his house in Berlin and here recorded in his letters. He records numerous conversations and the private views of all the main protagonists, including Baron Meyendorff, Baron von Schleinitz, Mr. D’Usedom, the King of Prussia, the Russian Emperor, the Danish plenipotentiaries and the French ambassador, etc. He reports on the signing of the Treaty in July 1850 (Westmorland was the British signatory to the treaty) and the arguments that broke out almost immediately afterwards, etc. The letters also contain detailed intelligence and reports on discussions concerning the Zollverein, trade and various proposals for the unification of the German States. The letters also deal in detail with the threat of war between Prussia and Austria, during which time Westmorland was in close contact with the Prussian Foreign Minister, Manteuffel and the Austrian representative in Berlin, Prokesch. VOLUME 3 Vienna. 27th September 1854 to 14th February 1855. As British ambassador to the Austro-Hungarian Empire. 354pp plus a 14pp index to the 251 letters and telegraphs which the volume contains. The letters and telegraphs are mostly addressed to Lord Clarendon (then British Foreign Secretary) but a few are addressed to other correspondents, including Lord Raglan in the Crimea, Mr Calquahoun and Mr Harris, etc. The volume contains extensive and detailed communications on a variety of subjects, commencing with a long 7pp explanation given by Count Buol as to the present attitude of Austria and the unwillingness of his government to engage in a winter campaign. Of principal interest are the large number of letters dealing with the diplomacy and intelligence concerning the course of the Crimean War and, in particular, the stance taken by Austria in the matter, which has long been something of an enigma for historians. Westmorland’s role in this is an important one as he was the man on the ground in Austria and was party to all the important diplomatic negotiations then taking place in Vienna. In December 1854 an alliance, signed by Westmorland, was concluded between Britain, Austria and France. Austria had promised to defend the Danubian Principalities against Russia and had mobilized its armies but had been very reluctant to enter into any fighting. The allies, particularly Britain were very keen to bring Austria into the war on their side. The letters contain a detailed account of this diplomacy and the negotiations leading up to the Vienna Conference of March 1855, at which Westmorland (with Lord John Russell) was Britain’s negotiator. Four points had been suggested as conditions for a treaty but historians have generally concluded that Britain was not particularly interested in securing a peace until much stricter terms had been imposed on Russia. They failed to reach agreement on the terms of a treaty, with the result that the Crimean War continued for a further year. 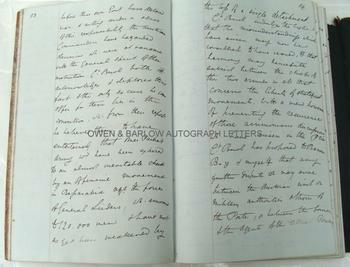 A very remarkable series of letters in which Westmorland records and reports in detail on intelligence, conversations and private communications involving various figures, including Count Buol, Count Collerado, Arif Effendi, M. Benedetti, Count Esterhazy, Derwish Pasha, Prince Ghika, Omer Pasha, Napoleon III, the Austro-Hungarian Emperor and other protagonists and their representatives. All three letter books are folio (approx. 12.5 x 8 inches). Sheep or roan bound in portfolio style bindings. Bindings somewhat rubbed and worn. Contents are very good or fine. Until the latter part of the 19th century, it was the sole responsibility of individual embassies and consulates to record and keep copies of all outgoing official correspondence. Such correspondence was often unrecorded elsewhere, although the outgoing copies of letters and dispatches to the Foreign Office were, of course, filed with the F.O. records. Official letter books were normally deposited with the Foreign Office in London at the conclusion of an ambassador’s tenure and ultimately deposited with the Public Record Office. For whatever reason, it seems that the Earl of Westmorland did not do so in respect of these three volumes of his letters and, as far as we can establish, they have not until now been made available for research. General John Fane, 11th Earl of Westmorland (styled Lord Burghersh until 1841), was a British soldier, politician, diplomat and musician. He was aide-de-camp to the Duke of Wellington (his wife's uncle) and fought at Talavera and Busaco during the Peninsular War. He served as Minister to Tuscany between 1814 and 1830, as Envoy Extraordinary and Minister Plenipotentiary to Prussia between 1841 and 1851 and as Ambassador to the Austrian Empire between 1851 and 1855. Westmorland was also a talented musician and composer and was the founder of the Royal Academy of Music.